Offers > TDS Business > Choose VoIP and build a smarter, faster communications network for your business. Voice over IP (VoIP) has become a foundational part of communication and collaboration practices for internet and phone for leading companies in recent years. Not only is VoIP cost effective--with savings ranging from 3% to 40% per company--but it also consolidates inbound and outbound communications, such as voice, email and fax, into one system. This integration of voice with email and contact management gives VoIP users a competitive edge, improving customer relationship management and increasing profitability. Businesses will see more efficient management by their employees with a voice system that allows for collaboration across multiple desktop devices and from virtually anywhere in the world. 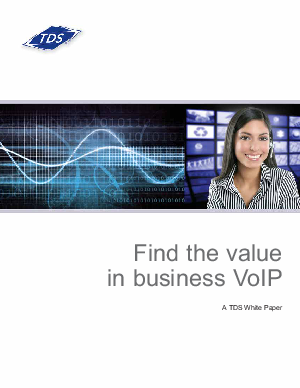 We encourage you to download this free whitepaper and learn more about how VoIP can be the perfect fit for your business’s phone and internet communications.